It is always interesting to know what great creative people felt, how they created their masterpieces, how they lived, who influenced their world outlook. Meanwhile, documentary films are a great chance to learn more about the outstanding people of art. Baku had a great opportunity to learn more about the personality of cult Lithuanian photographer Vitas Luckus (1943-1987), through the "Master and Tatyana" documentary, which was shown in the Azerbaijani capital. Directed by Lithuanian filmmaker Giedre Zickyte, the film was shown at the Park Cinema Flame Towers within the 2nd Imagine Euro Tolerance Festival being held in Azerbaijan May 2-17. 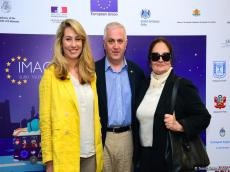 Ambassador of Lithuania to Azerbaijan Valdas Lastauskas, Chairperson of the Union of Cinematographers of the Republic of Azerbaijan, People's Artist Shafiga Mammadova, famous figures of culture and art, admirers of documentary films attended the event. "Imagine Euro Tolerance Festival has been held for the second time and I hope that it will develop in the future,” Lastauskas told Trend. “We try to demonstrate the films by best Lithuanian filmmakers within the festival. In 2017 documentary filmmaker Audrius Stonys demonstrated his recent films. This year Giedre Zickyte has been taking part in the festival. She represents young generation of Lithuanian filmmakers." The viewers in Baku were interested in the film because Vitas Luckus visited Azerbaijan. During that trip a number of photos were taken and, of course, he had many friends here. In the film, Luckus' friends speak about his way of life, his relations with this wife Tatyana, long conversations till dawn, numerous guests. There are also legends about the photographer's life. Some of them seem incredible. Luckus kept a lion in his apartment, and this is true. "Master and Tatyana" is the story of a rebellious creator, a story of passionate love and a story of life that ended in tragedy. Of course, an important part of the film is a conversation with Tatyana, who after the tragic death of her husband moved to the US. In the film there are many photos taken by Luckus, which also help to better understand the photographer. The film aroused great interest. A Q&A session was set up with the director, after the screening. Luckus’ friends also came to watch the film. They said that in Azerbaijan Luckus liked to shoot Gobustan, Absheron and some of those photos are still kept at their houses. “Master and Tatyana” was screened in many festivals across Europe and North America, including the world's biggest and most prestigious documentary festival IDFA (International Documentary Film Festival Amsterdam) in the “Best of Fest” section. In 2015, "Master and Tatyana" was awarded by the Lithuanian Film Academy with the national award Silver Crane as “The Best Documentary of the Year”, as well as in the nominations "Best Director", "Best Filmmaking", "Best Editing". The film was also screened in Lithuania and broadcast for audience in Italy, Sweden and Poland.